Lester Crown at the Crown Center's 10th anniversary celebration. The Crown Center for Middle East Studies recently threw itself a 10th anniversary party — and there was plenty to celebrate. The brainchild of President Emeritus Jehuda Reinharz, PhD’72, H’11, the Crown Center has defied conventional wisdom by producing balanced and dispassionate Middle East research, something observers once thought impossible. Crown Center research has been broadly disseminated to both those who make policy and those who shape opinions. The center’s researchers have produced nearly 100 Middle East Briefs, detailed 4,000-word analyses of important regional issues of the day. 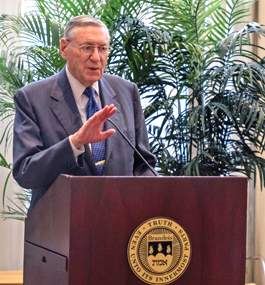 At the center’s 10th anniversary celebration in September, Lester Crown recalled conversations he and cousin Charles “Corky” Goodman, G’09, had with Reinharz 15 years ago about launching the center. Thanks to the Crown family’s support, the center is poised for growth. Last year, it moved to its new home, the totally renovated Lemberg Hall. The Crowns also recently established the Renée and Lester Crown Professorship of Middle East Studies and announced a forthcoming faculty chair to be named in Feldman’s honor. “I want to express my heartfelt thanks to the Crown family, not only for your support but also for your guidance in defining the mission of this center, its vision and its direction,” Interim President Lisa M. Lynch said at the anniversary event. In the future, Feldman plans to recruit more junior researchers and mentor them to become the next generation of leading scholars. The center will also increase its involvement in Washington, D.C., as well as in the Middle East by partnering with research centers in the region. The way Manny Landsman sees it, excellent students and faculty form the core of all top universities. “There’s no sense having good students if you don’t have good faculty, and no sense having good faculty if you don’t have good students,” he says. So Landsman and his wife, Sheila, used their most recent gift to Brandeis to help keep the faculty side strong, creating the Landsman Career Development Chair in the Sciences. The Landsmans, who have supported a number of important initiatives at Brandeis, including the Landsman Charitable Foundation Endowed Scholarship, targeted their latest gift so it boosts the career of young science faculty. The gift began to take shape when Landsman met with Lynch, the Maurice B. Hexter Professor of Social and Economic Policy, shortly after she became interim president on July 1. The most visible sign of the Landsmans’ enduring support of Brandeis is the campus’ Landsman Research Facility, home to a 15,000-pound superconducting magnet used to search for cures to neurodegenerative diseases and cancer. The 800 MHz magnetic resonance spectrometer, which stands about two stories tall, allows scientists to take a unique look at biological macromolecules such as DNA, RNA, enzymes and other proteins. Researchers from many area schools — including Harvard, Brown, Tufts, Boston College, Boston University, the University of Massachusetts and the University of Connecticut — also use the “800,” as it is called. Additionally, the Landsmans have supported the Office of Technology Licensing, which manages the patenting, licensing, trademarking and copyrighting of intellectual property developed at the university. Manny is also a member of the university’s Board of Fellows and formerly served on the Science Advisory Council. In 1981, Landsman co-founded American Power Conversion, which developed uninterruptible power-supply devices for computers. The company is now part of Schneider Electric, a French-based company that had revenues of nearly $25 billion in 2014. The Brandeis creation story is one I never tire of telling. 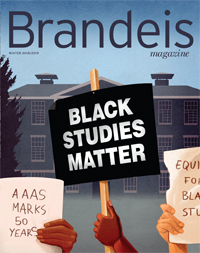 It begins with a group of American Jews, most of whom were not college-educated, coming together to discuss the “Brandeis Project,” an audacious idea to establish an institution of higher learning dedicated to academic excellence and open to all, without regard to religion, race or socioeconomic status. These founders believed so strongly in the ideals of inclusion, equality and fairness that they were willing to take personal financial responsibility for the enterprise, risking their families’ security to support the fledgling institution. They hoped that their initial gifts would create the foundation for a highly regarded university committed to scholarship, research and social justice, and that the alumni who benefited from the education they received would provide the necessary support to sustain the school in subsequent years. As we all know, the Brandeis Project became Brandeis University, and the dreams of the founders were quickly realized. Just 13 years after the university’s founding, its Phi Beta Kappa accreditation was conferred. In 1985, Brandeis joined the prestigious Association of American Universities. Today, it is one of the country’s leading private research universities. Just as our founders envisioned, alumni have played a key role in nurturing Brandeis. We annually rank among the top 10 percent of national universities in the number of alumni who make gifts. Our endowment is larger than it has ever been. More high-school students than ever before want to attend Brandeis. The university is on solid financial footing. But we cannot rest. We must continue to support our students and faculty. Securing additional funding for scholarships will allow Brandeis to maintain its commitment to educating the best students, regardless of their financial circumstances. We also need to keep our faculty salaries competitive with peer institutions to ensure that we attract and retain the best professors. I know our alumni, friends, trustees, parents and members of the Brandeis National Committee will continue to rise to the challenge. As we look forward to celebrating next year’s 100th anniversary of namesake Louis D. Brandeis’ nomination and confirmation to the U.S. Supreme Court, it’s important to remember the university’s history and our commitment to supporting it. Thank you for everything you do for Brandeis. 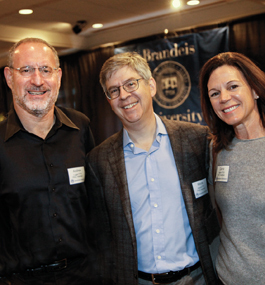 More than 125 alumni and friends attended this year’s Brandeis Night in Chicago, held at the city’s Arts Club and hosted by Trustees Dolores Kohl ’55, Len Goodman and Adam Rifkin ’97, and Laura Neiman ’97. Interim President Lisa M. Lynch shared a brief update about the university. Interim President Lisa M. Lynch visited with attendees at the annual Parents Advisory Council (PAC) breakfast during Fall Fest. Long before there was a Women’s Studies Research Center (WSRC) at Brandeis, Carol Rabb Goldberg admired the research being conducted by Shula Reinharz, PhD’77. Since founding WSRC in 2002, Reinharz and her innovative activist think tank have produced high-level research and widely disseminated the findings to make an impact on society. 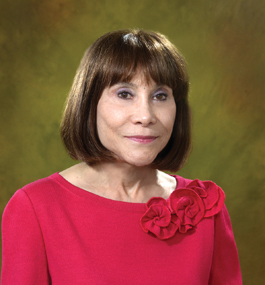 A longtime member of WSRC’s board of directors, Goldberg recently made a $250,000 lead gift through the Sidney and Esther Rabb Charitable Foundation (of which she and her husband, Avram, are managing trustees) to support the center’s ongoing fundraising initiative. The goal is to build a $2 million endowment before June 30, 2017, the planned retirement date for Reinharz, WSRC’s director and the Jacob S. Potofsky Professor of Sociology. “We thank Carol for this generous gift, which will help us continue to make a difference in women’s lives and society at large,” says Reinharz. Goldberg, who grew up in the 1930s and ’40s, says her parents, Sidney and Esther Rabb, and her husband supported her plans to attend college and pursue a career. After graduating from college, Goldberg joined the family business. She spent 30 years with Stop & Shop. She and her husband later founded the Avcar Group, a private investment and consulting firm. Although pleased with the progress of women in the professional world — Goldberg’s daughter, Deb, is the Massachusetts state treasurer — she knows plenty of work remains. 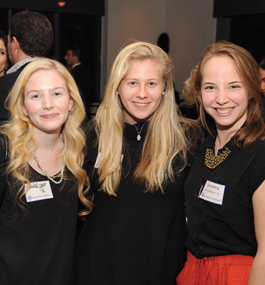 The students supported through the Edward Fein Scholarship Program met Amy Klein, Fein’s niece, at a reception. Interim President Lisa M. Lynch and Amy with the Fein Scholars.